Learn how to clean diamonds without running your beautiful jewelry. They say diamonds are forever and while the gemstone is very durable, it doesn’t mean that it will always be in perfect shape. Just as you do with your gold, gold plated and silver jewelry, diamond jewelry also needs to be taken care of. It’s not hard to do it and your effort is worth it. After all, if diamonds are a girl’s best friends, don’t you want to pay attention to your friends? 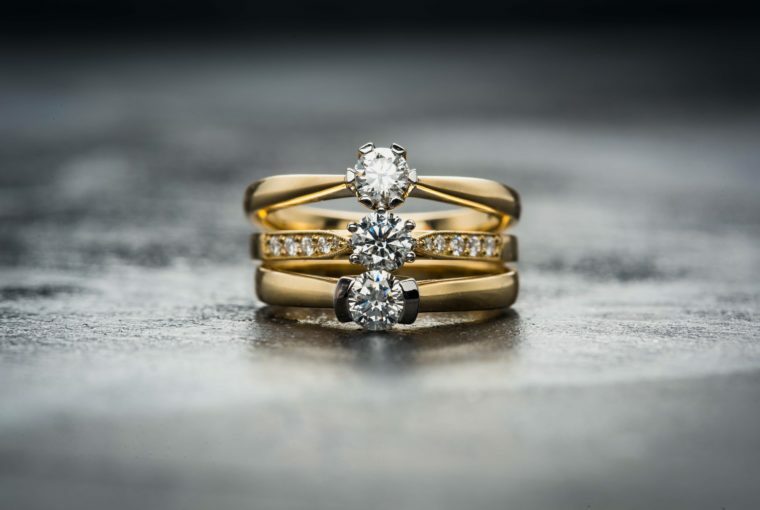 In this article, you will learn how to clean diamonds so that your stunning diamond ring or gorgeous diamond necklace looks dazzling no matter how much you wear it. Diamonds are the hardest material on Earth but, unfortunately, they don’t resist dirt or grease. In fact, diamond jewelry is a magnet for grease and while the substance doesn’t affect the stone, it will make it lose its brilliance. When you use body lotions, soaps or other cosmetic products, the chemical substances adhere to your diamond ring. But it is true that the skin oil also adheres to the diamond simply when you handle it. This means that no matter how much you try to avoid getting your diamond ring dirty, it will happen. And that’s ok as long as you learn how to clean diamonds regularly. Cleaning a diamond ring or a pair of diamond studs is not complicated. When you search on Google for information about cleaning methods, you will see hundreds of articles. Unfortunately, most of these articles don’t take into consideration the setting of your jewelry. Solutions with ammonia, soapy water, and other similar methods can be very efficient in cleaning your diamond. They can also be very efficient in ruining your setting. If you own a piece of jewelry which you absolutely hate, you can make a little experiment and see what happens when you soak a gold plated ring into an ammonia solution. But if you want to learn how to clean diamonds safely, avoid these DIY remedies. The gemstone will not get ruined (after all, it is the hardest material on Earth), but we cannot say the same about the setting. Instead, use a damp microfiber cloth to gently rub the jewelry piece. Then you can use a wet jewelry brush or soft toothbrush to clean the areas where dirt might get stuck. You can also purchase a jewelry cleaner, but make sure it is safe to use on diamond jewelry. Keep in mind that a diamond’s brilliance lies in its facets. The light reflects in and out of stone causing that beautiful sparkle which we all love. This is why, after cleaning your jewelry, you should polish the diamond’s facets using a lint-free cloth. Rub gently but thoroughly to ensure that the facets are clear of dirt. You can do this whenever you feel that your diamond ring is losing its sparkle. When you have learned how to clean diamonds, you have discovered the first part of maintaining your diamond jewelry. The second part, however, is protecting it. So here are a couple of things you should never do to a diamond ring. Don’t apply body lotions and creams when wearing your ring. The diamond will get dirty, but the setting can get ruined, especially if it’s platinum or white gold. Don’t wear your ring when exercising or performing intensive labor. Let’s put it this way. If you punch a wall wearing your diamond jewelry, the metal may scratch, the setting may break and you may lose the gemstone. We know you are not in the habit of punching walls, but there are other similar situations. When you exercise, when you care for your garden or work with tools, for example. Don’t miss appointments with your jeweler. Diamond jewelry usually comes with a warranty so you should take advantage of that. Bring your diamond ring or diamond studs to your jeweler for inspection. You can do this regularly to prevent the gemstones from falling out. Don’t do housework or cook with your diamond jewelry on. You should know that all those 60s commercials showing women baking with their pearl necklaces on were just commercials. In real life, women know that they shouldn’t wear their expensive jewelry while cooking or cleaning because it may get ruined. Now that you know how to clean diamonds, you need to start doing it. It may seem like an extra effort but, on the other hand, this tiny effort will ensure that your gemstone jewelry always looks fabulous. And speaking of fabulous, did you see our most recent designer jewelry collection? If not, take a look to see what we have in store for you. Visit ourAna Luisa online jewelry shop and discover gorgeous fine jewelry at fair prices.